We’ve been running a series explaining how to set up a fully functioning HACCP plan at your food processing plant, and in our last article we covered how to identify Critical Control Points, or CCPs. In this article, we’ll take a look at how to set critical limits for these CCPs, a range of values that the CCPs must not stray outside of. So you’ve been through your process, performed a hazard analysis, and identified which ones of these present a significant enough health risk to make them a CCP. Once you’ve identified your CCPs, you must define critical limits for each point. But how is the term critical limit itself defined? Well, a critical limit is a maximum or minimum value to which a biological, chemical or physical parameter must be controlled at a CCP to prevent, eliminate, or reduce to tolerable amounts the existence of a food safety hazard. Each CCP must have one or more critical limits for each hazard, and if the critical limit is ever deviated from, corrective action must be taken to maintain food safety. Once you know where you require critical limits, you need to know the actual values for them. This is where things get tricky, as there is such a huge variety of hazards, each with different acceptable values. Many times, the appropriate critical limits will not be readily apparent or available. Tests may need to be conducted, or information obtained from sources such as regulatory guidelines, scientific literature, or expert opinion. If the information needed to set the critical limit is not explicitly available, a conservative value should be set, erring on the side of caution. Reasoning and any reference material used should be kept as part of the HACCP plan material in order to justify decisions made. In many cases, there are a variety of different control options and measures. The selection of the best option relies on how effective they are, how practically they can be implemented, and previous experience with each option. Let’s examine a couple of these examples put into practice. If the hazard is biological, for instance, monitoring could be done by testing for pathogens, and an appropriate critical value would be the complete lack of pathogen presence after testing. However, this may not be the best option as microbiological testing can take time, so may lead to larger amounts of contaminated product if deviation occurs. Another much more practical option, then, would be to monitor temperature of the product post-cooking. 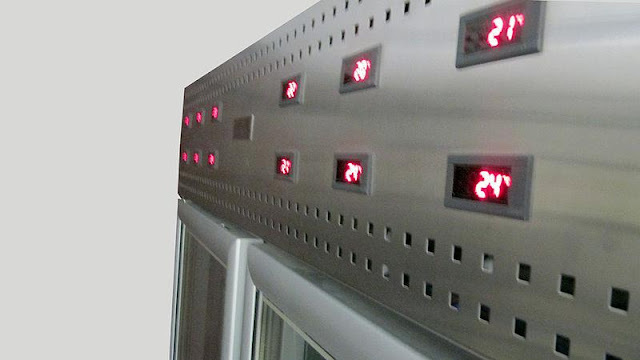 If you know that the biological hazards of your product are eliminated at a certain temperature, this temperature would be the minimum critical value, and a much more easily monitored one. Even temperature monitoring can be quite awkward, though, so a further refinement of your critical limits could instead regulate the process to the extent that product always hits a certain temperature, without it having to be tested for. 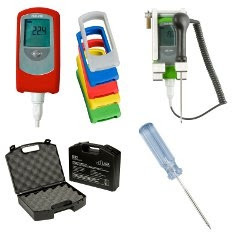 For example, if minimum oil temperature, maximum food thickness, and minimum cook time are all controlled to the right critical limits, all products will hit the minimum temperature levels without it having to be tested. 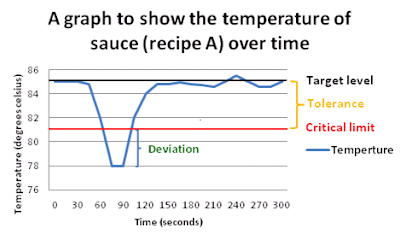 These variables can all be monitored much more easily and continuously than post-cook product temperature. On top of critical limits, some processing plants may like to set target levels. These are stricter levels, whose being breached won’t have safety implications but rather allow the plant some leeway before product becomes contaminated. Following target levels ensures that critical limits are never reached, and the process can be adjusted when target levels are exceeded to bring them back in line again. As target levels are not purely concerned with safety, they can also be designed to ensure product quality or account for normal variability (e.g. set 5 degrees above critical limit if cooker temperature can vary this much). The difference between target levels and critical limits is known as tolerance. This indicates how much parameters can slip outside target levels before significant safety risks arise. In conclusion, identifying your CCPs means nothing if they aren’t backed up by well-researched and considered critical limits. By choosing these appropriately, you can minimise risk of contamination whilst ensuring maximum process efficiency. The specifics of this rely on the nuances of your production process, but their importance means that they make up an important step in HACCP plan creation.